From Malawi, we drove into Zambia. Zambia is a scarcely populated, and a much poorer country than the others we have come across. 40% of the country is unemployed, and 35% are infected with AIDS. The lack of wealth is hugely evident as you drive through the countryside. Homes are small, and built of mud and scraps. Although this kind of lifestyle was found in other places, normally mud huts would mean a Masai village. In Zambia, everyone lives like this. Most of our time in Zambia was spent driving. We drove all day, stopped at a campsite, had dinner, a drink at the bar or a swim in the pool, head to bed, then wake up and do it again. Our second evening we watched the qualifying game for the African Cup quarter finals, but sadly Zambia lost in a game with no score. Then we played some locals at a few games of pool, and finally off to bed again. It was our third day that we finally got back into activities. Our final night in Zambia was in a town called Livingstone. Livingstone was named after David Livingstone, the man that discovered Victoria Falls (or Mosi Au Tunya in the native tongue). 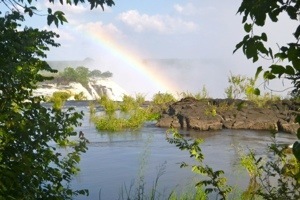 The falls border between Zambia and Zimbabwe and are the longest in the world. Even from our campsite, we could hear the crashing of the falls just a short 5 minutes away. When we arrived at the campsite just after lunch, we went to see about tours to the Devil’s Pool. The Devil’s Pool is insane. 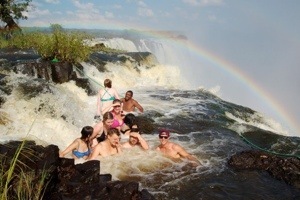 It is where tourists get to go and swim right at the edge of the falls. Nothing but a small rope divides the edge of the falls and us swimming. We were not about to pass up this opportunity. Unfortunately we had some problems booking the tour. The Devil’s pool and Livingstone island is owned by one company and one company only. They have a monopoly on the area, and can charge whatever and bring whomever they’d like to the falls. There are no competing tours or prices. The company has decided to limit the number of tours to four or five a day, and have a 16 person limit on each tour. This is PERFECT if you are just a couple people. The falls are quiet, it feels very un-touristy and you get more one-on-one time with the guide. It’s also probably a hell of a lot safer. I can’t imagine trying to keep my eyes on a couple hundred tourists teetering on the edge of a precipice. For our group, however, it was cutthroat. There were only 8 spaces left on the tour when we arrived; 14 of us were hoping to go. After a few backed out, we had 10 people who were 100% set on going. The lady at the booking office said there was no way two extra people could join the tour. We had to chose among ourselves who was going, and the last tour of the day left in 3 minutes. It was heartbreaking, but we fairly chose two names out of a hat to make our decision. Kelsi and Sandy’s names were pulled. The rest of us had to load up into the van immediately and head out. It really put a damper on the beginning of the tour. It was a quick five minute drive to the starting point: a five star resort right on the river’s edge. From the hotel you could see the spray from the falls just a little ways away. From the resort we hopped into a little speed boat and made our way to Livingstone Island. From Livingstone you are practically on the edge of the falls. It is just a small, forested island just a few steps away from the cliff edge. At this time of year, the waters are high. That means the falls are flowing fast and hard; right now, the actual Devil’s Pool is closed for swimming (and once we saw the tonnes of water rushing over the edge we could see why. No one could survive that). Luckily, there are equally as exciting ponds right next to the Devil’s Pool that are swimmable. When we all had changed into our swim suits, we started walking towards the first pool. Our guide walked us out into the pool, one at a time, until we were all inside. We were literally on the edge of the world. A thin rope, sitting in the water, was the ONLY thing that separated us from certain death. I was surprised at how strong the current was going over the edge. (Less surprised than I was shocked that anyone would let tourists swim in such a strong current). I found myself having to hold on to rocks beside me so that I wouldn’t be swept over the edge; a couple of us girls nearly lost our bikini bottoms as well. But as unnerving as it was, it was incredible to sit on top of the falls. The falls let off such a spray that there is a rainbow that can be seen to your left at all times in the water (could this get any more picturesque?). From that pool we all moved into the next pond aptly named “The Washing Machine”. The current whirled around so strong that there were bubbles in the water. We could only go into this pool one person at a time, and pretty much had to hold onto the guide the entire time. Then finally, our last pool was a short walk towards Devil’s Pool. From here you could easily see the tumultuous waters flowing over the devil’s pond. Nick and I looked at each other and both agreed that we were happy they closed the pool during this time of year. Instead, we swam in the one just a few dozen meters away. There was no rope at this pool. Just the edge. We got to take some photos standing on the very edge of the falls, looking over. It was nerve racking and so much fun all at the same time. When we’d had our full of the waterfall, we went back to Livingstone Island for high tea. The staff had laid out a wonderful meal of mini roast beef sliders, chicken curry and vegetable pastries and brownies for dessert. Also available was a free bar! We had a beer each and took some wine home with us as an “I feel guilty, but here is some delicious wine we stole” for Kels and Sandy. Tea was served under a white canopy with linen table cloths and several too many forks and knives at each place setting. I felt very five star sitting there in my wet bikini. We met two hilarious old ladies from the States who left their husbands at home to travel around Africa together. They were our entertainment for the evening for sure. After chatting with them for a while, it was time to head home. We packed up our gear and moved from five star resort to camp grounds in a matter of minutes. When we arrived we found out that there was an opportunity to do the early morning breakfast tour for those that had missed out on high tea. I was so excited to hear that Kelsi got to visit the falls as well! (And she had an equally amazing time). So far, Victoria falls has not disappointed! 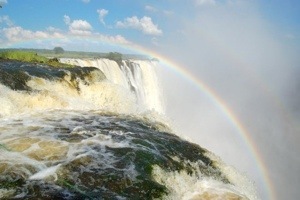 This entry was posted in Africa, Zambia and tagged The Devil's Pool, Travel, Victoria Falls, waterfalls, Zambia by hilarylust. Bookmark the permalink. 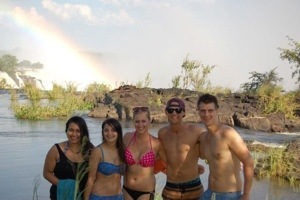 Vic Falls have never disappointed me! Driving from Malawi, did you ever visit the very authentic South Luangwa/Mwufe national park that is quite close to the boarder on Zambia side? I agree! 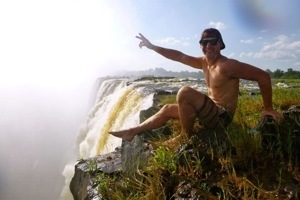 I loved every second of Vic Falls! Both from the Zambian and the Zimbabwean side. Unfortunately, we didn’t spend any time in the national park. I do believe we drove near it, but sadly not in it. Too much to see in such a short time!